Growing asparagus is a unique process that requires a lot of patience. However, if you like to eat asparagus, the rewards are definitely worth the wait. And over the long run, asparagus is much less expensive to grow yourself, compared to purchasing it in the grocery story. Asparagus is unique because it takes at least a year from the time you plant until you can harvest. As the plant gets older, more and more shoots are available for harvest over a longer period of time. Asparagus is a perennial vegetable, meaning it will come back year after year on it's own. Once you have an established asparagus patch, relatively little effort is required to maintain the plants. Most asparagus plants have a 10 year life expectancy. However, we have heard of cases where the plants live much longer. Asparagus plants are either male or female. The male plants are more desirable because they produce many more smaller stalks. The female asparagus plants produce much fewer and larger stalks. Asparagus is a very healthy vegetable that has several good properties. It has a high folic acid content, which has been shown to prevent birth defects. 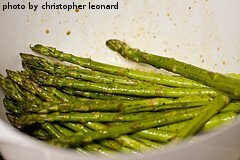 Some studies suggest that adding asparagus to your diet may lower cholesterol levels. Asparagus also contains antioxidants that are known to help prevent cancer. Additionally, some studies suggest that eating asparagus increases the success rate of chemotherapy. Asparagus plants are usually grown in a traditional garden. Because they get large after a couple of years, they are generally not grown in containers. Asparagus plants require a loose and airy soil to be grown successfully. They need to be planted relatively deep to establish a successful and expansive root system. Asparagus will tolerate partial shade, however the more sun the plants get, the higher the yields will be. 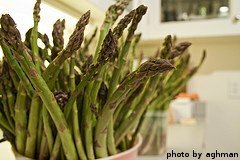 Asparagus generally grows best in climates with cold, freezing winter weather. This allows established plants to enter a dormant stage, where they can rest and store up energy to come back bigger and better the following spring. Without cold weather, the plants end up as large ferns and they don't produce good spears. 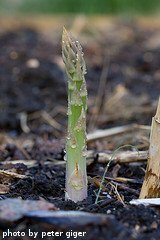 Click on the following links to learn about planting, fertilizing, harvesting and cooking asparagus.